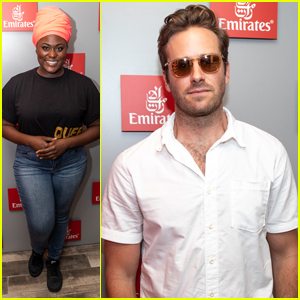 Armie Hammer, Tilda Cobham-Hervey, and Dev Patel team up at the premiere of their new movie Hotel Mumbai! The co-stars hit the red carpet during the 2018 Toronto International Film Festival at Princess of Wales Theatre on Friday (September 7) in Toronto, Canada. Tilda and Dev are also a real-life couple. 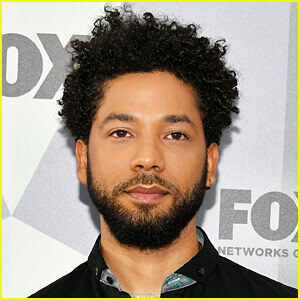 They were joined by their castmates Jason Isaacs, Nazanin Boniadi, Anupam Kher, Suhail Nayyar, Manoj Mehra, Amandeep Singh, and director/writer/EP Anthony Maras. Armie‘s wife Elizabeth Chambers was also there to show her support. FYI: Armie is wearing Salvatore Ferragamo. Dev is wearing Ermenegildo Zegna Couture with an IWC Schaffhausen timepiece.. Elizabeth is wearing a Vika Gazinskaya dress, an APM Monaco ring, and BaubleBar earrings. Nazanin is wearing a Prabal Gurung dress. Armie Hammer and Elizabeth Chambers were stunning couple at the Cartier Juste Un Clou event! The duo hit the red carpet separately at the New York Fashion Week event on Thursday night (September 6) at the Cartier Mansion in New York City. Armie and Elizabeth were also joined at the event by Zoe Saldana, Justin Theroux and Lily Collins. Other attendees included Troye Sivan, Sofia Coppola, Suki Waterhouse, Taylor Hill and Rachel Zoe. FYI: Lily is wearing a Zuhair Murad dress. Zoe is wearing a Dolce & Gabbana outfit. Suki is wearing an Alexander Wang outfit. 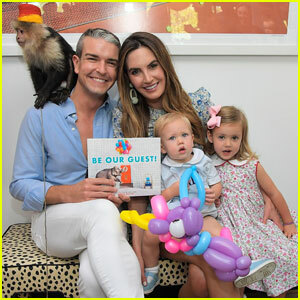 Elizabeth Chambers is celebrating her friend Gray Malin‘s new children’s book! The 35-year-old actress stepped out at the Be Our Guest! release party on Friday (May 4) at the author’s studio in West Hollywood, Calif.
Elizabeth brought along her and husband Armie Hammer‘s children Harper and Ford! Also in attendance was Whitney Port, who brought her son Sonny. Be Our Guest was compiled from Gray‘s acclaimed series of photographs at the Parker Palm Springs, where the guests and staff are more than a little unexpected! It was a star-studded evening at The Hollywood Reporter and Jimmy Choo’s Power Stylists Dinner last night! Gwyneth Paltrow, Mary J. Blige, Chadwick Boseman, Daveed Diggs, Armie Hammer and Elizabeth Chambers, Kevin Hart, Jennifer Morrison, and Louise Roe celebrated the most powerful stylists in Hollywood with an intimate dinner at Stanley House in Los Angeles on Tuesday (March 20). Stylists who were honored include Wayman Bannerman & Micah McDonald, Jason Bolden, Micaela Erlanger, Petra Flannery, Annabelle Harron, Samantha McMillen, Jen Rade, Law Roach, Elizabeth Saltzman, Elizabeth Stewart, Tara Swennen, Ilaria Urbinati and Kate Young as well as Michael Fisher, Chris Horan, Jeff Kim, Jamie Mizrahi, Ashley North, Marni Senofonte, John Tan, Ashley Weston and Jeanne Yang.